President Donald Trump told drugmakers at a White House meeting Tuesday they were charging too much and promised to get better bargains for government health programs, in addition to finding ways to get new medicines to market faster. Trump has threatened to have the government negotiate prices directly with the industry on behalf of Medicare and Medicaid, which are some of the world’s biggest purchasers of health-care products and services and cover tens of millions of Americans. 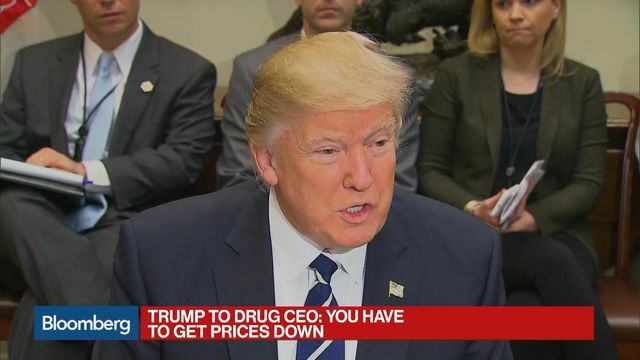 “Competition is key to lowering drug prices,” the president said. At the same time, Trump promised to slash regulations, get new treatments to market faster at the Food and Drug Administration, and increase international competition. “We’re going to streamline FDA; we have a fantastic person” that will be announced to lead the agency soon, Trump said. He also promised to cut taxes on business and lure companies back to the U.S.
Trump Calls Drug Pricing ‘Astronomical’ and Promises Changes – Bloomberg.